From exploring her rich experience of having a mother and grandmother from two different cultures to celebrating the roots and rhythms of gospel music, Toyomi Igus infuses her work with meaning. A former editor and publications director for UCLA’s Center for African-American Studies, Igus has been writing for kids since the early ’90s. Her mission as a children’s book author is to “generate work that educates and enlightens young people.” For years, she has done just that. In 2004, Igus was inducted into the Western New York Women’s Hall of Fame for promoting literacy among children. Before becoming a children’s book author, you were a magazine journalist. Please tell us about your journey to children’s book writing. 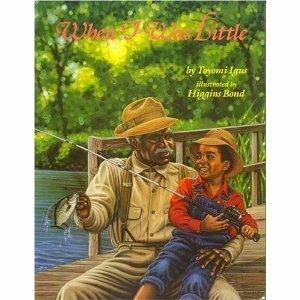 How did your first picture book, When I Was Little, illustrated by Higgins Bond (Just Us Books), come to be? What was your break? 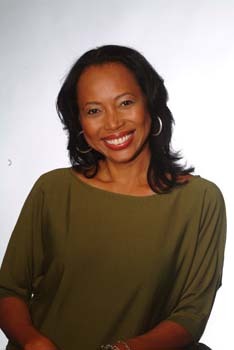 I left magazines and started publishing books for the Center for Afro-American Studies at UCLA as its managing editor. I met Wade and Cheryl Hudson (of Just Us Books) and other black book publishers at the book conventions we attended. We started talking and one thing led to another. 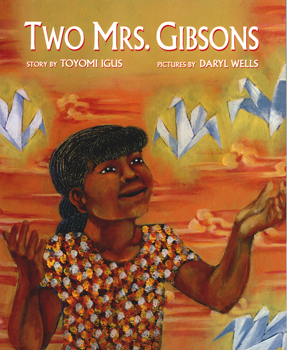 . .
You wrote in your biography that Two Mrs. Gibsons, illustrated by Daryl Wells (Children’s Book Press), is a work that’s very personal. How did that story evolve? What did it mean to share it? It is the story of my mother and grandmother, both of whom had passed away by the time I had my children. I wanted my kids to know these two women, who were amazing people and the greatest influences of my life. My kids were very young, so I had to find a way to describe them in a way that they could understand—hence the compare and contrast treatment. Once the book was published, I hoped that other young children raised in a bicultural and/or biracial family would appreciate it as well. 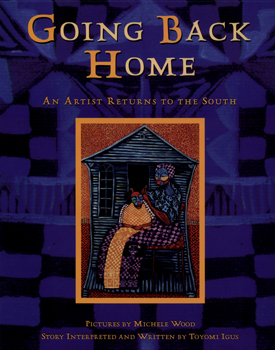 You collaborated with illustrator, Michele Wood, in Going Back Home: An Artist Returns to the South (Children’s Book Press). Please tell us about that project and your working relationship. Because I was trained to interview people as a magazine writer and editor, it was a natural process for me. I just talked to Michele about the meaning of each of her paintings and then worked with the editor to organize the paintings with the narrative in a way that would move the story forward, revealing Michele’s motivations and inspirations—and do it in a way that spoke to children. That was the hard part. 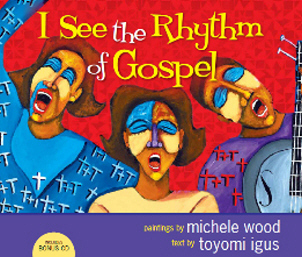 You and Michele also teamed up on the wonderful I See the Rhythm picture books series. The first, released in 1998, won the Coretta Scott King Award for Illustration and was named an Honor Book by the Jane Addams Children’s Book Award. What inspired that book? What was your collaborative process like? The editor of Children’s Book Press (Harriet Roehmer, the founder of the press) was the inspiration. She saw Michele’s exhibition of paintings about African American music and thought they could be compiled into a book. Harriet asked me if I could pull it together, so I did. The book is the result of strong teamwork between me, the artist, and the editor. Unlike the development of most children’s books, this one did not start with a story or concept. It started with paintings—fine art—that we translated into a book. I took the pictures and sat with them, analyzed them, interviewed Miche le, worked with Harriet to develop an outline, ran that by Michele, who had to make some changes to the art (and create new art) based on the outline. I had to balance the messages conveyed by the art with my own text and the timeline, so that the sum of the parts would tell a more complete story. We worked back and forth in this way until we had the final product. The second, I See the Rhythm of Gospel (Zonderkidz), was released in December. Already, it’s winning praise. Booklist called your text “stirring” and Wood’s folk art “inventive.” What were the challenges and rewards of creating a sequel? Will you and Michele team up for more books in the future? 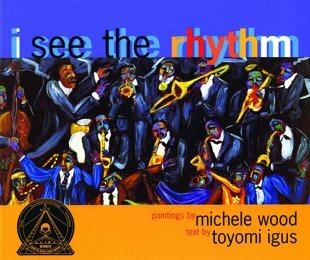 This Rhythm book was a bit different because Michele did not have a complete series of paintings already developed. She and I worked on an outline together, developed a couple of sample chapters with art, and pitched them to our agent and publishers. Once we were contracted to complete the book, we used t he outline to work back and forth between developing the art images and the text messages to get the full story. The challenge was that sometimes we were in sync and sometimes we weren’t! But it all worked out well, I think. Another challenge—and ultimately reward–for me was to write the poems more clearly in a child’s voice, and I am happy with the result. I feel this book reflects more my own intentions and perspective than the last. Regarding more books, Michele and I are discussing another in this series and there is some interest. We’ll see. Your books have won many accolades. What writing accomplishments make you most proud? How do you measure success? These days, I measure success not by what I produce, but how content and happy I am in my life. I have achieved a lot in my life—in children’s books and in my other roles as a writer, editor, marketing communications specialist, as well as mother, friend, wife, provider—so I feel very successful. It has nothing to do with awards or recognition or money—although those things are always nice! But if I had to choose accomplishments I am proud if, I would say there are two: “Zeke: A History of Blacks in the Movies” (a one-man play I wrote with my husband years ago, which ran in Los Angeles), and Two Mrs. Gibsons. I am happy with that book because I have received so many positive comments and letters from people who are raising children in households where the parents are of two different cultures, races, religions. They see past the racial and cultural depictions in my book to read deeper into the story—and they really appreciate it. That kind of feedback has been the most rewarding to me! What was the toughest moment of your writing career? Waiting to see if my first submitted freelance article would be accepted! How has your voice and vision changed over the years? My vision hasn’t changed at all. I use my communications skills (on all fronts) to bridge cultural, social, and informational divides and to give voice to those who can’t express themselves. And people haven’t really heard my own voice in most of my work; instead, what you hear is me, channeling the voices of others. If anything has changed it’s that I seek to sharpen my own voice these days. This may or may not be revealed in the form of a children’s book, however. My mission is to generate work that educates and enlightens young people. I want our youth to think more critically, understand history, human nature, and culture so that they can see that where they have come from and who they are isn’t so different from others. Even though we are each born into our own unique lives, personalities and bodies, we—as humans—share a common spirit, and if we can connect there, we can do great things. The same advice I would give writers beginning to write for anyone—just do it! Write and then share your story with others; see how it resonates with your audience (in this case, children); then edit, rewrite, and edit and rewrite again. You never know how the muse will reveal herself! In my day-to-day work life as a health care communications consultant, I am about to launch a major project that will help consumers better understand what they should expect from their health care system and the new health reform law. In my personal writing, I am working on a few other book ideas of my own and considering another project with Michele. My children—who are not children anymore!